The ECB has always lagged the U.S. Federal Reserve in terms of policy decisions. The late start of its QE programme meant the late “recovery” (although that is questionable) of the Eurozone. Given the late start as compared to the U.S., the ECB only started reducing the pace of its asset purchases in March 2017 from €80 to €60 billion per month until December 2017. In late 2017 it further announced that it will scale back its net purchase to €30 billion per month from January until at least September 2018, which was subsequently extended to December 2018. Why is the ECB likely to reduce its balance sheet? As the global financial crisis unfolded, the ECB and other central banks introduced new policies such as Quantitative Easing (QE) to support growth. The idea was to weaken the currency (the Euro in this case), increase exports, lower financing costs for European governments and corporations and give the stock market a boost. These measures are no longer required as the Eurozone is (apparently) growing well. How is the ECB likely to reduce its balance sheet? The ECB has said that it will reduce its bond buying net purchases until they reach zero, before raising rates and ceasing the reinvestment of the principal of its maturing assets. For the moment, the ECB has managed to scale back its asset purchases without causing mayhem much trouble in the European bond market, but we have written earlier that European Countries only have a fiscal surplus due to ultra-low interest costs (thanks to ultra-low bond yields because of the ECB bond buying program). What is the new normal for the ECB? 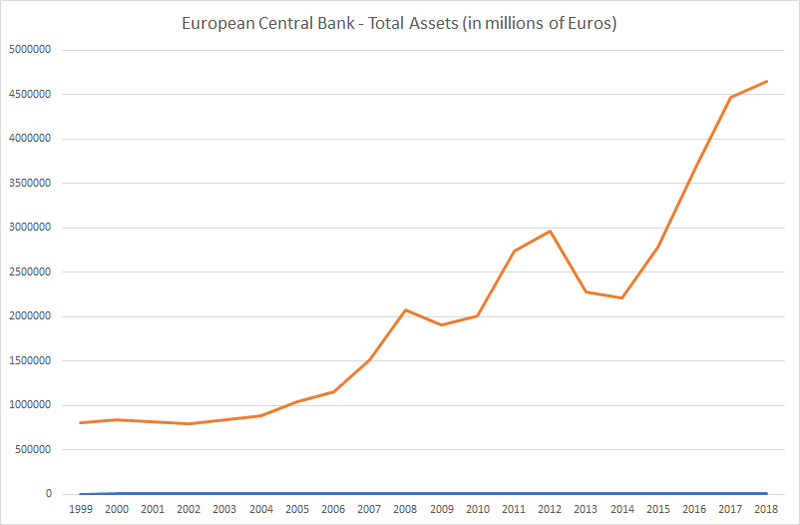 Before the financial crisis, “normal” for the ECB meant key interest rate of 3% (currently 0%), the ECB balance sheet being under 10% of Eurozone GDP (it is currently 45%), short term financing as assets with banks (it is currently 90% long term) and a minimum reserve ratio of 2% (it is currently 1%). What will the new normal mean? Well, don’t expect the old normal to be the new normal. It is highly unlikely that the key interest rate will be 3% before 2023 unless there is a major crisis and the ECB is forced to raise interest rates to that level. The ECB is also unlikely to unwind its balance sheet by €3 trillion to bring the balance sheet to GDP ratio back to 10%. However, current projections state that by 2038 (20 years away) the ECB balance sheet will be back to 10% of Eurozone GDP. The Reserve ratio could be increased but given that the European banking crisis is far from over, this is unlikely to happen soon either. The new normal is likely to be low (if not ultra-low) interest rates, an expanded balance sheet and continued support for weak Eurozone banks.